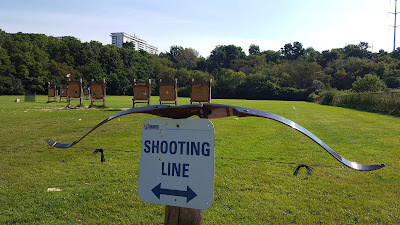 If you are here looking for archery lessons in Toronto, I have some sad news for you: I am official retired, as of today. I announced my upcoming and now present retirement back in July in the following post: My Retirement from Personal Training / Sports Training. The details and reasons for my retirement are listed there. Unofficially I may still end up teaching a few archery lessons in the future, only on weekends, and only when my new schedule allows me a little extra time to teach. Otherwise you will just have to shop around for a different archery instructor, which I am sorry to say there are few archery instructors who have the knowledge and experience that I have, having done archery for 28 years and having taught archery for 8 of those years. I know a few archery instructors who teach 1 or 2 styles, but I know of no other instructor who is qualified and experienced at teaching all 5 styles. I have been told that my retirement will be "a loss to the Toronto Archery Community" and I am not going to dispute that I have made some contributions to the promotion of the sport in Toronto. In the 8 years that I was teaching I taught well over a thousand different people. I don't know the precise number because I did not keep accurate records in the beginning, but I do estimate that I was teaching approx. 150 to 200 different students each year. The exact number is likely in the 1,200 to 1,600 people range. 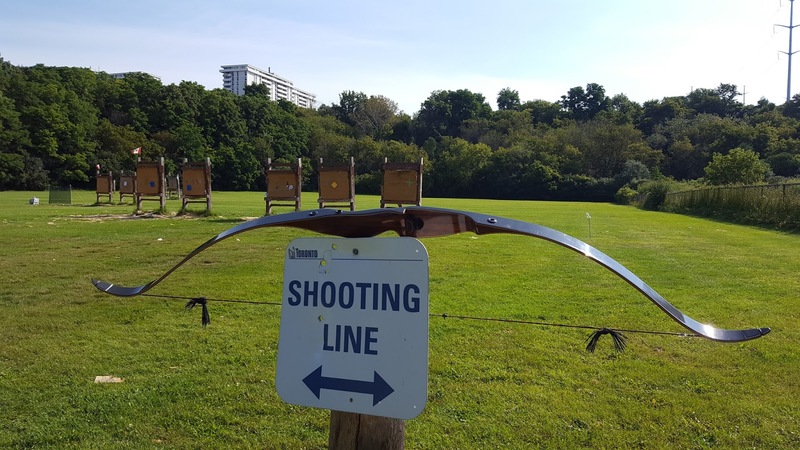 Many of my former students now visit the Toronto Archery Range on a weekly or monthly basis to continue practicing their sport. Some of my former students have gone on to compete, including several Olympic contenders from overseas. Some students came from very far away to study with me. From South Korea, from Japan, from the USA, Britain, Ireland, France, Russia, Saudi Arabia and a variety of other locales. Some of them came all that distance just to study archery under me. I do not discriminate with students. I have taught young and old. As the years went by I began cutting back on the younger students, preferring to teach people who are 16 years old or older - but I sometimes made exceptions and taught younger students if they were exceptionally interested in archery and showed a keen obsession with the sport. I also thoroughly enjoyed teaching seniors. 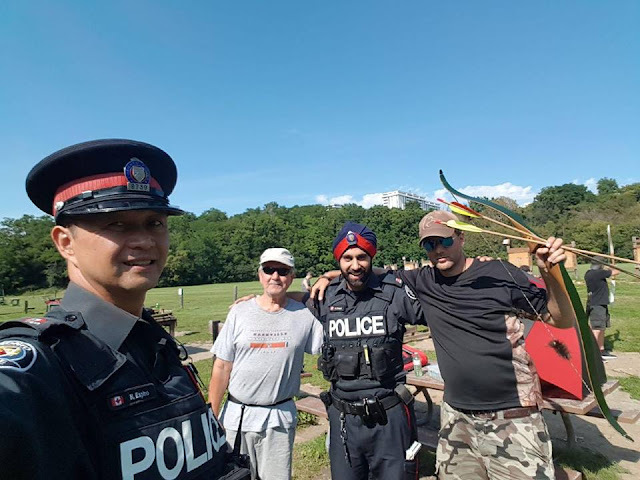 In the photo below is two police officers who were visiting the Toronto Archery Range, one of my former students from 2014 (John G.), and myself in the sunglasses / Ducks Unlimited hat. This photo was taken recently, on August 14th 2017. John has become a regular at the archery range over the past 3 years and students like him have been a highlight of my archery teaching career and one of the reasons I give discounts to seniors. I am going to miss teaching archery. It has been the most enjoyable career I have had thus far. I got to meet lots of interesting people, make all sorts of archery jokes, educate people on the history of archery / the sport of archery, and promote one of the greatest pastimes of all time. It therefore makes sense that I won't be giving it up completely. I will continue to teach from time to time, schedule permitting, but it will be very different from my current schedule of teaching approx. 10 to 15 lessons per week. There was a time a few years ago when I was teaching 18 to 21 lessons per week, and frankly feeling exhausted after teaching 5 lessons in a single day. I eventually realized that I needed to cutback on teaching so many lessons and relax more. Around that time I raised my rates, cut back on my total number of lessons I was willing to teach per week, and started scheduling more vacation time. Such vacations likely helped in the wooing of my wife and resulted in our marriage in August 2016. Quickly followed by a Honeymoon in Montreal. 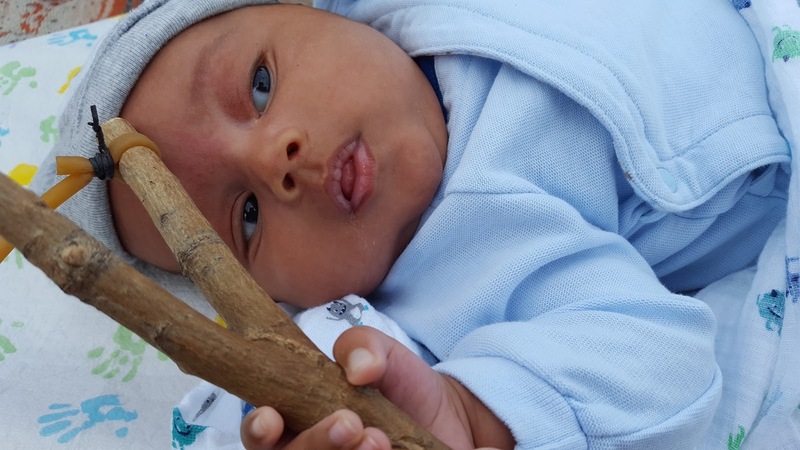 A few months later we began planning the birth of our son Richard who arrived in late June 2017. (2.5 weeks before his due date, I guess he was impatient to meet us.) Below is a photo of our son Richard with a slingshot during a recent trip to the beach. He doesn't know how to shoot it yet, but I had fun shooting beach pebbles into Lake Ontario. In a few short years he will be shooting that very slingshot and learning how to shoot his first bow. With both parents doing archery and a number of other relatives who do archery (including my cousin Ken who is the 1990 and 1991 Traditional Recurve North American Champion and had so many trophies he was throwing them out...) Richard will raised thinking archery is something that many people do - and frankly many people do archery, it is just not as much as say soccer or baseball. I have a long list of things I want to do with my life, outside of raising my son with my wonderful wife. I listed some of those things on my previous post announcing my retirement. 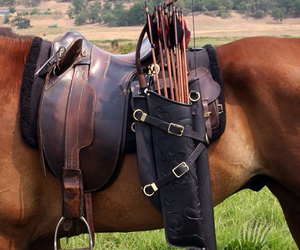 One of the things I most would like to do is to buy a horse farm, raise horses and teach equestrian archery. To me that would truly be living the dream. If I could add Falconry to that dream, that would be fun too. The website isn't going to disappear, I can tell you that. I am going to keep using it to promote exercise and a variety of sports, including archery of course. By the end of 2017 I expect there to be a total of 830 posts on this website and I will continue to do 5 to 10 posts per month indefinitely. The big change will be that I will be adding Google Ads on the side of the website, and I will be allowing advertisers to post sponsored articles in the future for a reasonable fee. (I have a baby to feed and clothe after all, and babies are not cheap, so I see nothing wrong with allowing some advertising.) All ads will be family friendly and abide my sense of good morals.